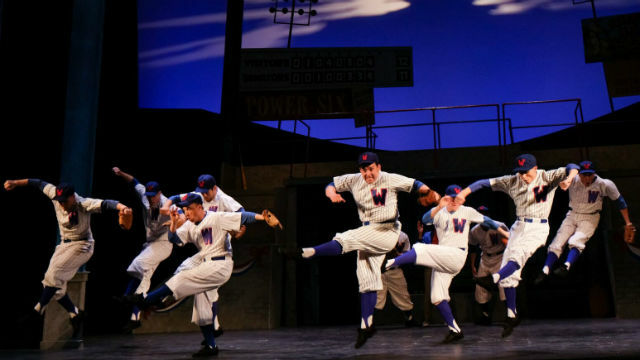 A scene from “Damn Yankees” at San Diego Musical Theatre. They’re offering a rousing rendition of the 1955 classic, which won 7 Tony Awards, including Best Musical. In 1994, director Jack O’Brien launched a revival at The Old Globe, and he revised the show at that time. Director James Vasquez, a local favorite, is using the original version. It’s commendable to pay homage to history, but the show clocks in at nearly 2 1/2 hours, and despite all the high-octane singing and dancing, it feels sluggish at times. Maybe it’s all those ballads and reprises (two for “A Man Doesn’t Know,” a sweet love song, but it’s not one of the show’s enduring numbers). And though award-winning musical director Don LeMaster has pulled out all the stops with a smashing 21-piece orchestra that sounds every bit like Broadway, with the waning of attention spans and the reduced tolerance for old-fashioned work, perhaps the time has passed for long overtures and entr’actes, and extended dance interludes — with apologies to Don and to Jill Gorrie, whose choreography is inventive and high-spirited. You gotta love baseball players who wield their bats like baton-twirlers! The musical has many pleasures, starting with its storyline, a re-working of the Faust legend, based on the Douglass Wallop novel, “The Year the Yankees Lost the Pennant.” In this case, a diehard Washington Senators fan sells his soul to the devil for a crack at being a baseball phenom and helping the ever-losing team snag at least the Pennant, if not the Series. Wallop co-wrote the musical’s book with the legendary playwright/producer/director George Abbott. The lyrics and music are by Richard Adler and Jerry Ross. When Joe Boyd says he’d sell his soul to lick those Yankees just once, the dapper, red-socked Mr. Applegate suddenly appears to grant his wish. Joe is thrilled to transform into a 23-year old superstar, Joe Hardy, but he has trouble leaving his beloved and devoted wife, Meg. So, he negotiates an escape clause. Meg. Hard-hearted Lola kind of falls for the guy — for the first time in her 172-year life, and she gives Joe a break, enabling him to return to Meg. Love conquers all in the end. It’s a fun show, and there are wonderful moments in this production, but it could use some tightening, shortening and a more fleet-footed pace. Still, the performances and production values are outstanding — except for the sound (those pesky head-mics) on opening night. Steve Gunderson and Tracy Ray Reynolds are strong-voiced and endearing as Joe and Meg. Jonathan Sangster and Lafras Le Roux are ball player standouts, for humor and hotness, respectively. Christine Hewitt is noteworthy as the nosy neighbor, Sister. Katie Sapper brings eye-popping dance moves to the role of the insistent reporter, Gloria Thorpe. David Kirk Grant draws laughs as the Senators’ manager. And the Big Three certainly deliver: Neil Dale is a hoot as Applegate, relishing his inherent evil and his unreliable fire-trick, but whether it was the pitch of his voice, or the mic/sound problems, it was often difficult to hear or understand him. Scenic designer Sean Fanning continues to amaze. This is one of his more elaborately scene-shifting sets, a clever 2-D cartoonish representation of multiple locales, effortlessly moved and nicely lit (Nate Parde). Janet Pitcher has gone all out on the costumes, starting with those ‘50s housewife shirtwaists and aprons, and cleverly red-themed attire for Applegate. (Lola’s getups could be a tad sexier, to match her temptress moves). The show has some terrific songs: (You Gotta Have) “Heart,” “Whatever Lola Wants (Lola Gets),” and “Those Were the Good Old Days.” (For my money, “Who’s Got the Pain,” though it’s a famous Bob Fosse dance number, could easily be jettisoned; it adds nothing to character or story). Is baseball still the American Pastime? Is “Damn Yankees” the best of the old musicals? Both open for debate. But one thing is a sure bet: this production sports plenty of visual, vocal, dance and musical delights. Performances are Thursday at 7:30 p.m., Friday-Saturday at 8 .pm. and Sunday at 2 p.m.